Get a Handel on this: The Blogger Kid and I visited the Walt Disney Concert Hall on Wednesday night to check out a holiday tradition I've long been intrigued by: The Handel's Messiah Sing-Along. 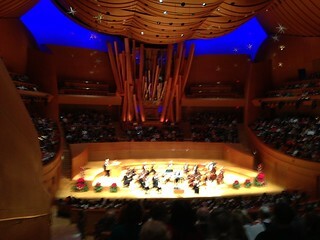 And indeed, it was a fascinating experience to be standing in Disney Hall as hundreds of people around you sang "For unto us a child is born" and of course, the famous "Hallelujah" chorus. Conducted by music director Grant Gershon, the Los Angeles Master Chorale impressed with tenor Arnold Livingston Geis, bass Chung Uk Lee, mezzo soprano Nike St. Clair and soprano Zanaida Robles. But the star of the show was the audience, of course, and this crowd came to sing -- many of them clutching their own ear-torn copies of "Messiah." Copies of the music to sing along were $10, but the Blogger Kid and I decided to forgo singing the songs and just soak it in. We couldn't stay too long -- it was a school night, after all -- but I'm glad to have experienced it and share it with the kid. The Los Angeles Master Chorale's Christmas celebration continues this Saturday, Dec. 14, with a "Festival of Carols." (That also is a bit of a sing-along, and boasts well-known, famous holiday tunes.) And on Sunday, Dec. 15, it's the non-sing-along version of "Handel: Messiah." Ticket details here.